Description: A pair of E8's are on the point of Pascack Valley train 1606 on a dark winter morning. Description: Old and new at Hoboken Terminal. What was then new is gone now, too! Description: A W/B train to Port Jervis passes a U34 laying over for the night at Waldwick yard. 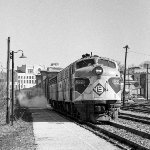 Description: E8's 822 and 833 on a westbound train to Port Jervis. The EL track numbering system had the low numbers on the outside in multiple track territory. The 3 and 1 on the signal mast will be reversed after the start of Conrail. Description: A freight sneaks west on the Main Line with an amazing 3 E8 lashup. Power like this is very out of place on the eastern end of the EL for this time period. Track in the foreground is the Newark Branch. Scanned from a slide. Description: Digital image from Kim E. Piersol original 35mm Kodachrome transparency. Pullman Junction, 95th & Stoney Island Ave., Chicago. Description: A few E8's are still around since the last order of U34's and Comet 1 coaches hasn't been delivered yet. Westbound near County Road. 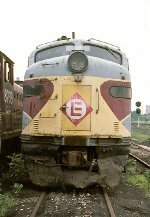 Description: EL E-8A 822 rests retired at the Juniata shops deadline in July, 1978. Title: Port Jervis to Hoboken. Description: Wouldn't let me write Tuxedo. Description: Sitting next to an SD45. It was not unusual to have them in the same consist.